I’m an old fashioned girl. I’m not talking candlelight and roses, although that’s nice. I’m talking about food preservation, medicine making, cooking methods, and brewing. I like old, tried and true methods, and I’m a sucker for ye olde tyme vocabularie wordes, too. Here’s a lovely, dark electuary of herbs for women’s health. Elecutary is an archaic term that refers to a herbal medicine mixed with syrup or honey. Its textures and ingredients obviously vary, and it can be taken as a paste, or rolled into small pills. In the days before distillation, honey was used as a preservative in kitchens and even in the tombs of kings. The word itself is assumed to be from Greek, ekleikhein, which means “Lick Out.” No matter how old or responsible I get, reading the phrase “lick out” makes Beavis and Butthead’s laughtrack play in the back of my mind and I can’t help but giggle! So how do you use an electuary? The standard ‘dose’ for a sweet herbal paste is usually a teaspoonful taken as needed, depending on the electuary’s potency. It can be stirred into hot drinks (tea, milk, hot water) or taken straight off the spoon, or even on buttered whole grain toast. 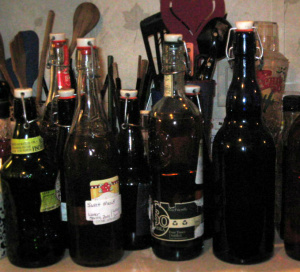 I’ve even used electuaries to make medicinal mead and fermented drinks! Goldenrod honey, soaking up the sun. This is an important part. My preference is always honey from a source local to you, preferably raw. Local, raw honey contains pollen from the plants in your area, and can help with building up a tolerance to some airborne pollen allergies. You are also helping to support your local economy and in this time of ecological change and dubious farming methods, we need all of the responsible beekeepers and bees that we can stand! I go into this in further detail in this post. 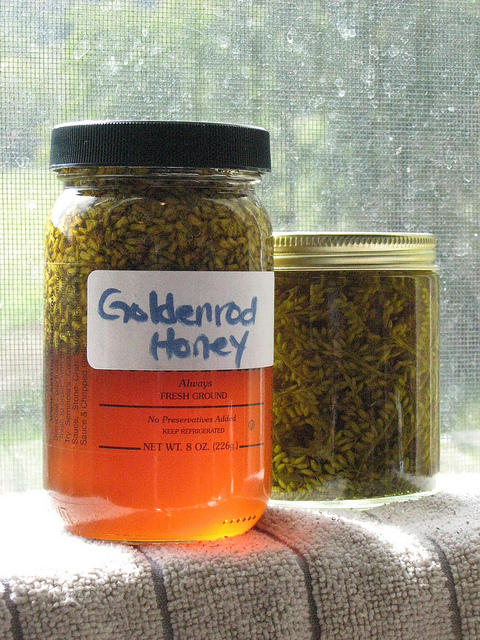 Look at the goldenrod flower honey pictured on the right, and then think of all of the edible plants in your yard. Rose petals, spruce tips, basil leaves, lavender flowers, or even orange and lemon slices can be fantastic additions to a jar of honey. Fresh herbs are strong and add something special to honey, but also tend to make it have a shorter shelf life than using dried herbs. Get a clean jar and add your fresh herbs. Cover with honey and stir it with a chopstick to get out air bubbles. Put a lid on the jar and let it sit in a sunny window or warm place for a week or two. Strain the honey into a sterilized jar. The honey will likely be runny now, due to the liquid from the plant matter. Therefore, it needs to be stored in the fridge or run the risk of it going moldy. Don’t forget to label the jar! Using dried herbs offers an advantage over fresh herbs, as these honeys store much, much longer and do not require refrigeration. 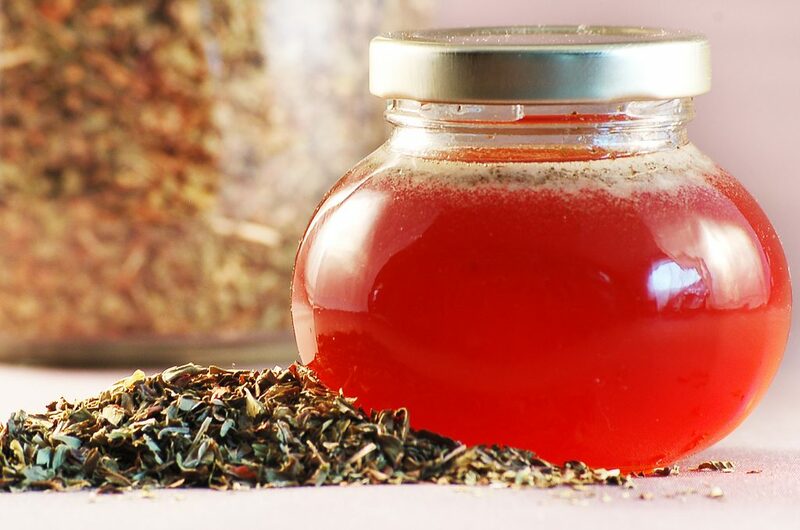 Basically, any aromatic herb leaf or flower will work, but dried roots must be ground before being added to the honey. I’ve also noticed better, more potent results if I use a bit of heat to encourage the dried herbs to infuse into the honey. Powdered ginger: great for warming the blood and opening the sinuses, as well as easing the tummy! Vanilla Bean: OH how well honey and vanilla go together…just delicious! Chamomile: Make a honey for a night-time or calming tea. Cayenne: A little heat goes a long way! My method for infusing dried herbs into honey is to use a double boiler or similar gentle heating method. Allow the water to get up to a simmer and reduce heat to low. Add honey to the pot and allow it to warm up a bit, so that it is easy to stir. Add your herb and stir it in, and allow it to rest on the low heat for an hour or so. It is your choice whether or not to strain the honey before jarring it. I don’t bother straining honey made with ground herbs, or large bits like vanilla bean or cinnamon stick. Otherwise, transfer the honey to a measuring cup and pour into clean jars! Label once cool and enjoy! Oh, one more thing! Whatever method you used…DON’T THROW AWAY THE STRAINED HERBS! Toss them in a jar and cover them with a booze of your choice – vodka, brandy, or rum being my favorites. 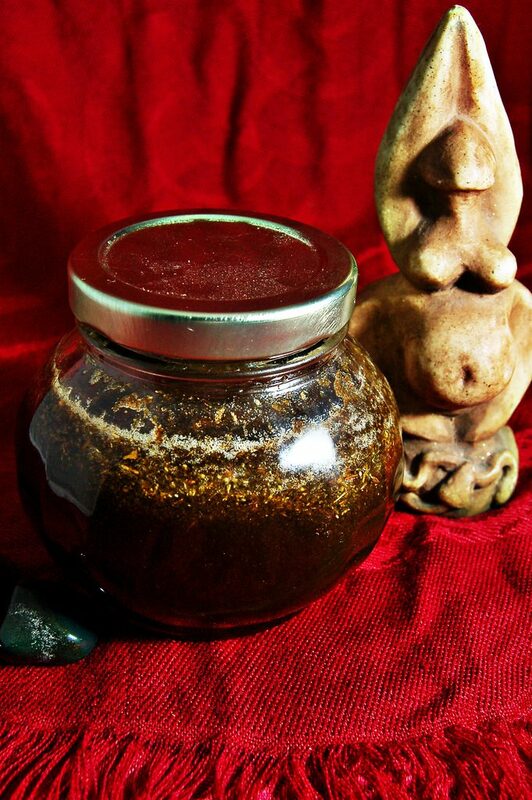 Cover the jar, shake, label, and strain it after six weeks and you have an herbal elixir! Here’s more about herbal elixirs, cordials, and tinctures. Enjoy playing with sweet medicine. Reward your palate with an herbal treat and remember…a spoonful of sugar makes the medicine go down! Just made a gallon of the dried elderberry mead. Honey has gotten so expensive, I have to add some fruit, and I love elderberry. I made it similar to my wintertime immunity-boosting syrup; elderberries, local honey, cinnamon, and ginger. Thank you very much for the inspiration! That sounds delicious! Let me know how it turns out!! Oooh, no, I have not. I haven’t had the chance to play with fresh St. John’s Wort, but I hope to! 🙂 I’ve never tried it dried in honey, either. Let me know how it turns out! I wonder if it will go red like the oil does. Ooh, these sound lovely! And so easy to make. I hadn’t heard of electuaries before, so thanks for sharing! What a wonderful use for herbs. That’s a lovely blog you have, Emma, and your profile picture is adorable. 🙂 Thanks for commenting, and have a lovely weekend! Love the idea of reusing the stained herbs. I just love reading your blog and it’s so straight forward! I read alot last year and I always come back to yours. Thank you so much for sharing and I hope to see more. Thank you, Deanna, that’s so kind of you to say! 🙂 I’ll keep on sharing posts and such, don’t you worry! Thank you sooo much for this post! .. somehow i must have missed it and just found it now ..even though i subscribed almost a year ago and infusing honey has been my passion over the past 6 months! i didn’t realize you had these amazing posts! !!thankyou!! It’s so great to have your insight! You are giving me peace of mind. I am still in my first year of making herbal medicines and something woke up inside me triggering perhaps certain skills i had in past lives? … i have this huge affinity for making medicines and definitely a passion for herbal honey infusions.. i’ve been making electuary’s and didn’t even know this is what it was until i read your post.. ..so you have definitely given me a greater understanding here! Isn't it wonderful to play with sweet magic like this? 🙂 Enjoy!